The International Osteoporosis Foundation projects that by 2020, 61 million Americans will be affected by osteoporosis. This does not include those who will be diagnosed with osteopenia, the less severe bone condition. Bone health is an area of ongoing research and of course, debate. The use of bone forming medications like Fosamax and the longstanding recommendation of increasing calcium intake through food and supplements both deserve a fresh look through the lens of knee pain doctor who practices functional medicine. Not only may the standard approaches not be as effective as hoped, but the real way to support and improve bone health may not be as hard to achieve as people think. Bones form and grow in mass and strength through the childhood years. This occurs through a process called bone remodeling. Osteoblasts are cells that facilitate the process of laying down new bone matrix. This is bone formation. Then osteoclasts break down bone which releases minerals into the body for nutrients and electrolyte balance. This is bone reabsorption. These two processes are constantly occurring all the time. Through childhood, the rate of formation is greater than reabsorption. About age 34, the tide turns, and bone reabsorption (breakdown) becomes greater than bone formation. Osteopenia occurs when the natural breakdown of bone happens faster than the body can lay down new matrix. 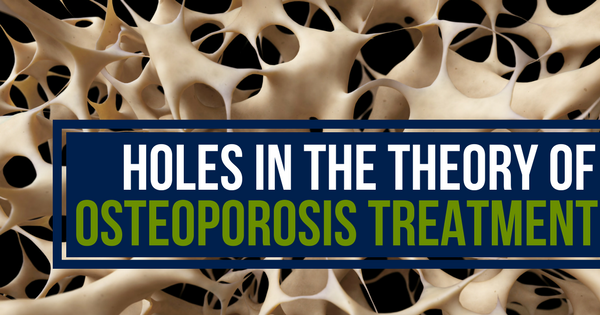 This results in bones with bigger holes in the matrix and softer bone tissue. The DXA scan (previously known as DEXA) is how this is measured/diagnosed. Osteopenia is occurring at 1-1.5 standard deviation below a young adult. Osteoporosis occurs when the osteopenia progresses to greater than 2.5 standard deviation below a young adult. The main complication with poor bone health is bone fractures. The older you are, the harder it is for fractures to heal. In the elderly, fractures can easily be the impetus of progressive declining health as secondary issues arise making it difficult for the elderly to heal from fractures. Although complications from osteoporosis sometimes do not come to fruition until much later in life, it is the bone health from age 34+ that sets the stage for avoiding fractures in later adult years. The cause of poor bone health is generally minimized by conventional medicine if not completely ignored since they focus primarily on treating symptoms, not healing underlying causes. However, if the cause of poor bone health is addressed, the bone health can improve. In addition, many of the issues discussed as causes are not commonly seen as the cause of osteoporosis, therefore, people are at risk for bone issues and do not even know it. There are actually many more causes than the standard lack of exercise, smoking, and excessive alcohol consumption. Our expanded list of causes to poor bone health is below. Each significant enough they could be an article all their own and have full bodies of research behind them. This last cause, autoimmune condition, is one worth expanding on a bit. That is the idea of Osteoporosis as an autoimmune condition. It has been well established that people who have autoimmune conditions have higher rates of bone loss, but the medical community has been slower to recognize it as the primary cause of osteoporosis. There are multiple ways in which the immune system is part of the ongoing bone remodeling process making it susceptible to being altered by inflammation. One of which is macrophages which are part of the remodeling process. These cells play a critical role in initiating an inflammatory response. Osteoclasts that break down bone in order to give the body necessary minerals and promote the growth of new healthy bone are a direct descendant of the macrophage. Over-activation of inflammatory pathways can stimulate osteoclasts causing bones to break down at higher rates than new bone can be formed, resulting in Osteoporosis. Bone density testing is the standard test used to assess bone health. It is a very useful test that needs to be done at the recommended ages as to not leave you susceptible to fractures in years to come. As is the case with most conventional lab testing models, it is not the full story of bone health. It also does not help to determine why the bone loss is occurring. It is imperative to know that bone loss is occurring, but it is as important to ask “why?” This is why bone resorption testing, hormone, and thyroid assessments are added in a functional medicine bone assessment. A bone resorption test is a simple urine test that looks at risk of osteoporosis. Far too often, bone density tests are catching bone loss at the point of osteoporosis, but when risk factors for osteoporosis are present, a bone resorption test allows the practitioner to intervene with bone support before disease develops. The crosslinks measured in this test show if accelerated bone loss is occurring. It is our assessment that conventional treatment for osteoporosis is too simplistic and in some cases, even dangerous. The conventional approach is to increase calcium from food and supplements, start a bisphosphonate medication such a Fosamax, and retest bone density. This approach does in many situations result in increased bone mass, but it is not necessarily decreasing rates of fractures or supporting heart health because of the problems with the medications. The problems with bisphosphonate medications are so extensive, we wrote more about it here. In short, these medications are causing not only severe pain, but spontaneous fractures in major bones, jaws that can basically disintegrate, and lasting effects far beyond stopping the medications. Essentially, these medications like Fosamax, Actonel, Reclast, Boniva, etc. are promoted as building bone, but in reality, they harden bone, making way for worse injuries while circumventing the body’s natural way of healing. Calcium supplementation is the other “go to” conventional treatment. It is recommended in doses up to 1400 mg or more daily and in the forms of conventional dairy products. What is missing is the additional vitamins and minerals that work synergistically with calcium for strong bones, and the guidance on calcium sources from foods and supplements that are actually absorbed by the body. It is estimated that only about 30 percent of calcium from cow’s milk is absorbed where 60 percent of calcium from leafy green vegetables is absorbed. Conventional dairy products come with them high rates of food sensitivities, cow’s milk allergy, and inflammation caused by the changes in protein and fat molecular structure in the pasteurization and homogenization process. When dairy is used as a calcium source, full fat, raw, fermented dairy sources should be considered for optimal absorption of nutrients. The full picture approach to bone health lies in the synergy. Conventional approaches ignore the synergy of vitamins and minerals that are the cornerstone of bone health. Adequate lab testing, comprehensive nutrient supplementation and attention to inflammation can result in the reversal of or prevention of osteoporosis for many people. The body is designed to heal. We are resilient and when we give our body the right tools, it inherently knows what job to do. This is no different in bone health. Supplementing appropriately for good bone health includes finding and correcting hormone and thyroid issues that will continue to antagonize good bone growth if not addressed. In addition, there are bone specific supplements that are very effective when part of a synergistic plan to give the bones all that it needs. Consider that bone remodeling is a matrix of many different elements which forms continually to keep new, bone mass occurring. Bone Morphogenetic Proteins (BMP): Bone-derived protein/collagen matrix that stimulates the body’s natural bone growth (unlike the type of bone growth from bisphosphonate medications). Lifestyle Toxins: Inflammatory foods, cosmetics, nicotine, alcohol, caffeine, prescription drugs, over-the-counter drugs, artificial food additives, colorings and preservatives, refined foods, and sugars. Osteoporosis rates are rising as the health of America declines and there is hope. Stopping and even reversing Osteopenia or Osteoporosis can be done and we have done it. It does not take much but it does take a Shawnee KS knee pain doctor who understands the unique synergy of bone remodeling and support. No bone support products work in isolation. The same is true for humans in general, but that is another topic. You are meant to thrive, heal, and be resilient under pressure. The stress of American culture and poor healthcare model is failing you, which is why we are relentless in our pursuit of healthcare that really works. Bone health is no different in the conventional attempts to treat symptoms instead of underlying causes. Simply taking a medication and a calcium chew will not get your bones where you need them to go. Bone health needs the synergy that is inherent in the functional medicine model. A knee pain doctor Shawnee KS patients recommend from LifeWorks Integrative Health is ready to help you get the health you need for the life you want.